"-" + RightNow.getDate() + "-"
You entered this Web Page at exactly: "
":" + RightNow.getMinutes() + " and "
The subparameters of the write( ) parameter are connected, or concatenated, with a + sign, which functions here as a string operator. Commas can also serve as (sub)parameter delimiters; confer, for example, the document.write( ) statement in the error-laden Primer #2 assignment script, which should now look much less mysterious. to display April, to use the current month, as 4 and not 3. Joe surrounds his getMonth( )+1 expression with a set of parentheses "so that the [arithmetic] plus sign wouldn't get confused with the [concatenation] plus signs linking everything together" - is this necessary? Indeed it is, if we delimit the subparameters of write( ) with + signs. When I removed the outer (getMonth( )+1) parentheses and reran the script, 1 was concatenated, and not added, to the getMonth( ) return, giving "31" (and not 4) for April. On the other hand, when I replaced the concatenation + signs with commas, I found that getMonth( ) and 1 are added with or without the outer parentheses. And for the sake of completeness, I finally found that if 1 is put in quotes, converting it from a number data type to a string data type, then getMonth( ) and "1" are concatenated with or without the outer parentheses. As intimated by the primer, the capitalization pattern of these methods must be followed or you'll get an error. 'RightNow.getmonth( )', for example, will generate "object doesn't support this property or method" and "RightNow.getmonth is not a function" errors (once again) with MSIE and Netscape, respectively. returns 1, telling us that the U.S. Constitution was signed on a Monday. "This is the date&nbsp;&nbsp;&nbsp;&nbsp;" displays as "This is the date ". This single, simple statement offers up a smorgasbord of new concepts for us to sink our teeth into. Let's take it from left to right, shall we? however, use of the var keyword, while 'good form', is not strictly necessary. Q: Are there any restrictions on what a variable name can be? Q: Does the new Date object have to be 'variabilized' in the first place? The current year is 2005. Q: Is the "new" keyword necessary? What happens if you leave it out? In most cases, however, leaving out the new keyword will throw an error as soon as you attempt to act on Date (variabilized or not) with a method; contra the primer, a "static" Date is not created. 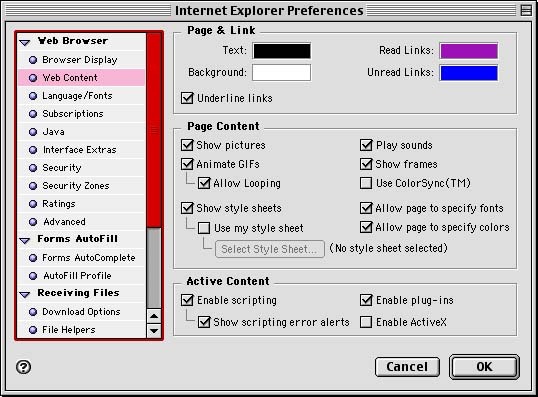 On my computer, MSIE gives in this situation an "object doesn't support this property or method" run-time error, whereas Netscape gives a "Date_object.method( ) is not a function" error. Q: What happens if Date is not capitalized? A: A " 'date' is undefined" error pops up. Indeed, "date", with a lower-case "d", is an acceptable variable name for the Date object. Q: Although Date is an object, the Date( ) syntax recalls that of the write( ) method. Does anything ever go in the parentheses that follow Date? 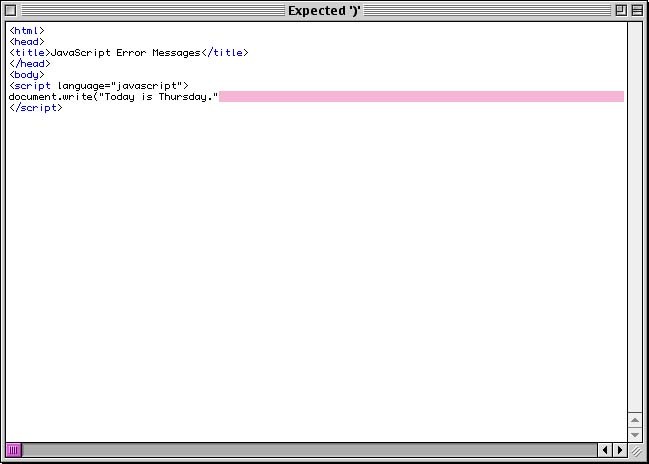 So much for the constructor statement. We'll address other issues of the Primer #3 script when we pick up the conversation in the next entry. I will not attempt to define these various errors but am merely listing them here 'for the record'. 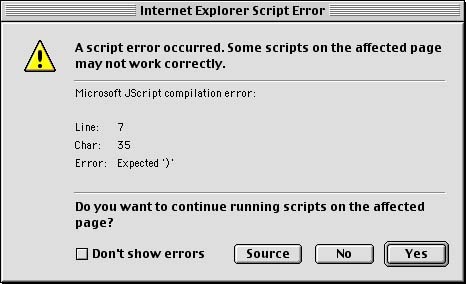 Unfortunately, some MSIE JScript error message windows do not give the aforementioned line and/or character information, nor a meaningful highlight in the source code - you're on your own in those cases. has no highlight of the error. Joe asks the reader to identify two errors in an 18-line block of code. 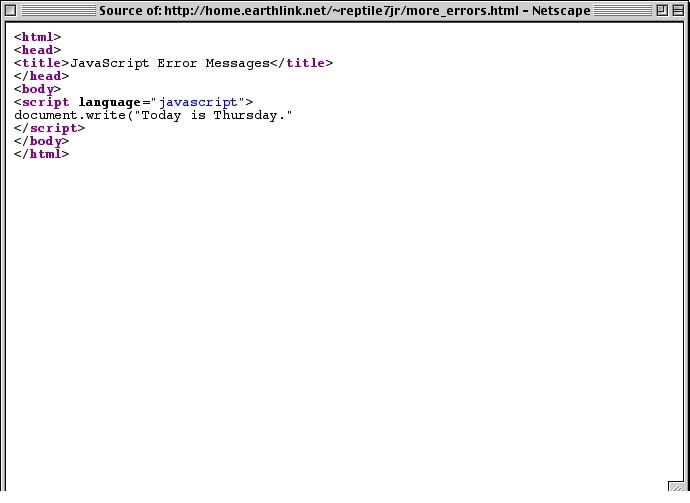 The second error, which is generated by the "document.wrte(" ",month,"/",day,"/",year," ")" 15th line, gives an "Object doesn’t support this property or method" run-time error with MSIE and a "document.wrte is not a function" error with Netscape - the misspelling of "write" is NOT a syntax error, in accord with our discussion earlier. 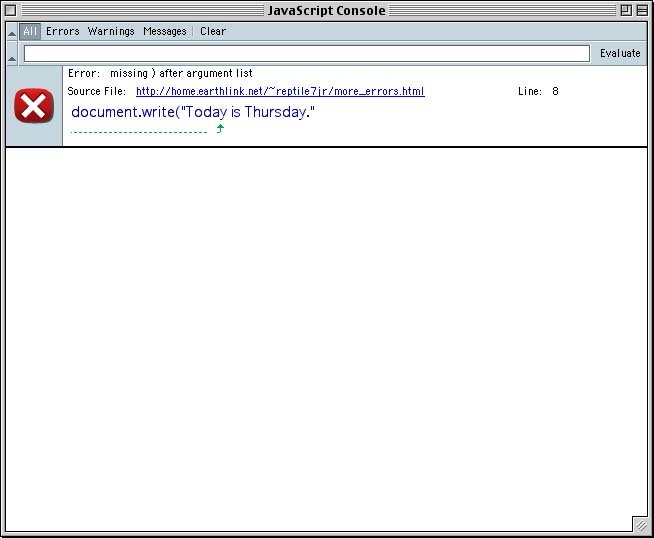 Line-breaks at any other location in the document.write("text for the page") line will give an error. but you can't put line-breaks here without getting an error, as we demonstrated last time. So there you have it - everything you wanted to know about line-breaks but were afraid to ask, at least for the time being. Practical information or academic minutiae? You be the judge. I still think it's a good idea to be cautious about where you might put line-breaks in a script, however.